Georgia has a special place in the agenda of the US legislating body. It was voiced by Senators Ron Johnson and Chris Murphy at a meeting with Giorgi Kvirikashvili, Prime Minister of Georgia today. Ron Johnson, Chairman of Homeland Security and Government Affairs Committee and Chris Murphy, Chairman of Foreign Relations Sub-Committee on Europe and Eurasia particularly noted the progress achieved by Georgia in recent years through its reform agenda. Senators welcome that Government of Georgia has maintained a stable development of the country, irrespective of the Russian aggression. Special emphasis was placed on the current progress achieved in the fight against corruption and steps made towards increased security. Also, attention was paid to the economic growth and development of the country, along with the large infrastructure projects with the engagement of Georgia. Ron Johnson and Chris Murphy also stressed the significant advancement of Georgia observed in recent years towards integration with the North Atlantic Treaty Organization (NATO) in terms of military reforms, along with political and economic reforms. 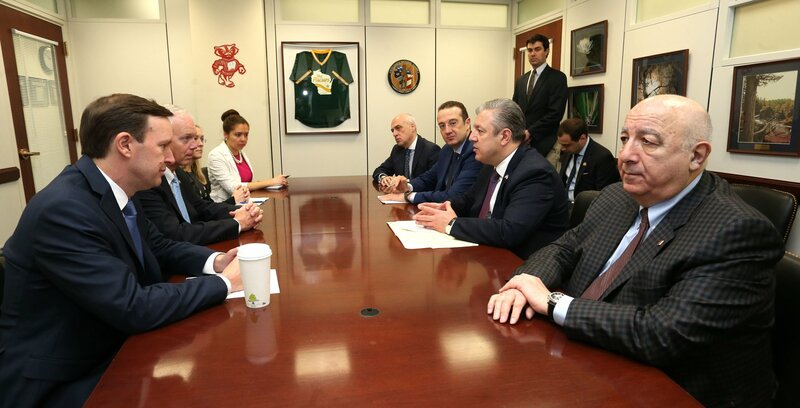 US Senators reiterated at the meeting with Prime Minister Kvirikashvili that Georgia has a strong, bipartisan support of Republicans and Democrats in the USA.